The English Personal Trainer helps you learn English using your own writing! Learning English is easy with Ginger's Personal Trainer which lets you practice English online with personalized practice sessions based on your own mistakes. This unique tool analyzes your writing in order to identify your weak areas in English, and provides you with lessons targeted at improving those topics. Stop wasting your time with generic English courses. Ginger's tailored exercises are the best way to learn English online. Start communicating fluently in English today! When there is a grammar topic that you haven't fully mastered, you might repeat the same mistakes over and over, both in writing and speaking. Ginger is the only grammar tool that helps you learn from your own mistakes. Ginger's Personal Trainer identifies the grammar topics that need improving by analyzing the mistakes in your writing. Then, Ginger English Personal Trainer shows you grammar mistakes you made in the past and explains how to avoid them in the future, in your written and verbal communication. How can Ginger help you improve your English? 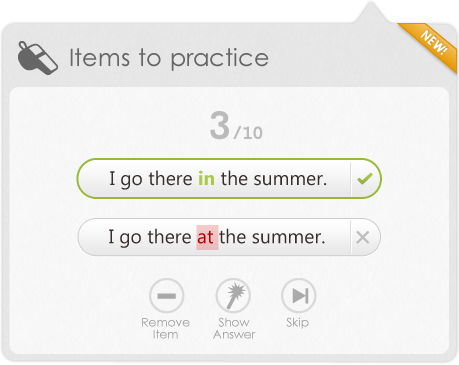 The Ginger Grammar Checker automatically corrects all your English writing, just like a native English speaker would. The Ginger Personal Trainer analyzes all your writing mistakes, in any application you use, and identifies which English topics you need to practice. It then shows you the most recommended topics for further practice. You will also be presented with corrections to your sentences and learn how to properly pronounce them. In addition, you will receive short lessons to help you avoid repeating the same mistakes in the future. You learn the topics that are most relevant to you, those that cause most of your writing mistakes. Frequently these are your most common spoken mistakes as well. You practice by correcting your own sentences, instead of textbook learning examples that are not necessarily relevant for your specific use of English. You learn faster because the learning program is personalized to meet your needs. No need to practice topics that you already know, or that are too advanced for you. Did Sara took you to school yesterday? → Did Sara take you to school yesterday? Did you speaked to the director? → Did you speak to the director? I did not called you yesterday. → I did not call you yesterday. She did not came here yesterday. → She did not come here yesterday. We talked about it for hours but didn’t agreed. → We talked about it for hours but didn’t agree. Didn’t you wanted to come? → Didn’t you want to come? First Ginger identifies that there is a common pattern of mistakes - like in the sentences above. Ginger’s Personal Trainer then shows you all of the sentences you previously wrote that are related to that same common pattern of mistakes, with their corrections (as above). Ginger's next step is to provide you with a short English lesson so that you can avoid repeating these mistakes in the future, in your written and oral communications. The Ginger English Personal Trainer is the perfect companion for learners of English as a second language and for those who want to avoid misused words, brush up on their English language or improve their English vocabulary for the SAT or GRE tests. Ginger helps all learners of English to learn from their mistakes, just like a human English Personal Trainer would. Based on the repetitive spelling or grammar mistakes and misused words of each individual English learner, the Ginger English Personal Trainer automatically creates a personalized English learning program with engaging English lessons and quizzes. Ginger’s patent-pending technology corrects all types of grammatical mistakes including topics that are not addressed by any other grammar checker. The Ginger Spell Checker is a contextual spell checker which chooses the correction that best fits the meaning of the sentence. Combining the Ginger Grammar and Spell Checker allows you to correct entire sentences in a single click. Click here to learn more about the advantages of using an online grammar checker. Click here to learn more about the basics of English grammar rules.